Conductor, composer and pianist Yaron Gottfried is one of the most prominent musicians of his generation in Israel, a multidisciplinary artist who bridges classical, contemporary and jazz music. Gottfried held the position of Music Director and Principal Conductor of the Netanya Kibbutz Orchestra for 11 years between 2002- 2013 with great success, presenting fresh innovative programs, packed halls, rave reviews and over 120 concerts in a season. He graduated his studies at the Rubin Academy of Music in Jerusalem under Maestro Mendi Rodan. Gottfried’s conducting repertoire spans from the renaissance period to contemporary music. Gottfried is a frequent guest at Israel Philharmonic Orchestra, In October 2016 He was invited to substitute for Maestro Zubin Mehta and conduct all eleven season opening concerts with major artists such as Yefim Bronfman, Khatia Buniatishvili , Prague philharmonic choir among others. In January 2015 he led the IPO replacing Maestro Valery Gergiev at short notice with an Israeli premier of Shostakovich 4th Symphony; the concert received rave reviews from the critics. In September 2015 he performed a German premier with WDR Funkhausorchester of his “Pictures at an Exhibition-Remake“ for jazz trio and orchestra after Mussorgsky. Highlights of the 2016-17 season include concert Maggio musicale Fiorentino orchestra, the Israel Philharmonic, San Jose Youth Philharmonic, Beijing Symphony orchestra, Jerusalem Symphony, Raanana Symphonette ,Tel Aviv Soloists Orchestra, Conducting a new production of Orfeo ed Euridice with the Israeli Opera and Macao symphony in Macao, Conducting the opening concert of the Rubinstein competition, and premiering four of his new compositions: Piano Trio, Nocturne for trumpet and Orchestra, Mongolian Suite for symphony Orchestra and a new Song Cycle. Israel Philharmonic, Jerusalem Symphony (IBA), Israel Symphony Orchestra Rishon LeZion, Israel Chamber Orchestra, Camerata Jerusalem, Raanana Symphonette, Sinfonietta Beer Sheva, China Philharmonic, Beijing Symphony, Chengdu Philharmonic, Manila Philharmonic, WDR Funkhausorchester, Potsdam Chamber Orchestra and Chorus, Tbilisi Symphony, Thüringen Symphony, Budapest Concert Orchestra, Debrecen Philharmonic, Kodaly Philharmonic, Brazos Valley Symphony, La Crosse Symphony, Portland Chamber Orchestra, Vancouver Symphony, Salta Symphony, L’Auditori – Barcelona Symphonic Band and Tallinn Festival Orchestra, among others. He is regularly invited as a guest artist to perform at major halls in China such as “Forbidden City Concert Hall“ (FCCH), Beijing Concert Hall, Beijing NCPA as well as festivals in China, Italy, Denmark, Georgia and Estonia. Gottfried’s unique approach to rhythm and sound is deeply reflected in his compositions which represent a fusion between genres and styles. His works are published by Sikorski Music Publishers. His “Pictures at an Exhibition-Remake“ was released in May 2014 on a new CD with GPR Records and is distributed by Naxos USA. The album received great reviews from Fanfare Magazine and in the Israeli press. Among his works are concertos, orchestral works, vocal works and orchestral arrangements. His “Baroque Jazz Project” for jazz trio and orchestra has been performed over 50 times, receiving high acclaim all over the world with many orchestras. A new tango album which he musically produced and arranged for international artist Yasmin Levy was released by Harmonia Mundi in September 2014. Gottfried is the Head of Composition and Conducting Department at Rimon School for Contemporary Music and Jazz. 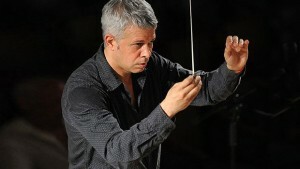 The Israel Cultural Excellence Foundation selected Maestro Gottfried as its chosen artist for 2003-2007. He is a member of the prestigious MacDowell Colony in the USA and 1st prize winner of the Young Artists Conductors competition held by the Israel Philharmonic and the America-Israel Cultural Foundation, and 1st prize winner of the Red Sea Jazz Festival Composition Competition. Gottfried’s deep musical interests in jazz led him to perform with major jazz artists such as: Eddie Gomez, Eddie Daniels, Didier Lockwood, Dave Liebman, Ira Sullivan, Randy Brecker, Georgie Fame, Kitty Margolis, Benny Golson and Jimmy Heath to name a few.